…finished for one of my kids. 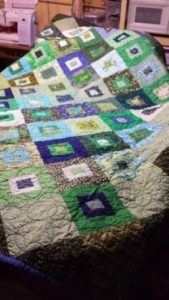 Like many quilters, I have some projects that have been languishing, er, waiting patiently, to be finished for a long time. This one started about five or six years ago. I dragged said kid along to various quilt shops to hunt for fabrics. I designed this based on a beautiful watercolor illustration by Gail de Marken in the must-read book The Quiltmaker’s Gift by Jeff Brumbeau. I designed it so it could be made from 10-inch squares of fabric (hellooo precuts), as many as you like. I was going to quilt it with a Triforce in each block, but my kid saved me and decided she’d rather have bubble-circles, which my favorite long-arm quilter lady could do. I finished the top last summer, had it quilted in the fall, and gave it to her over Christmas break. Long time coming, but she loves it. Now she’s doing some quilting of her own and planning the next one she wants me to make for her. She might get it in about, oh, ten years. Heh.